This is a special order item and is excluded from our 28-day home trial. Please allow up to 21 days for delivery. Our Mirrorstone 18W 4ft T8 LED Tube Light is a great replacement for your traditional fluorescent tube light – and it also brings across all the other advantages of LEDs. The hundreds of surface mounted diodes (SMDs) shine with 1500 lumens yet it use just 18W! An equivalent non-LED would use 100W – that’s over 5 and a half times more! Factor in a beam angle of 180o, 50,000 hour lifespan, and colour rendering index (CRI) of 70, and you have a tube light that isn’t just efficient, but one of the best in its field! The 4 foot length makes it ideal for commercial and retail applications, on a shop floor for example. You can pick whether you want your tube light to emit warm white (3000K) or cool white (6000K). Warm white is quite close to conventional halogens in terms of shade, whilst cool white is a lot brighter and has an icier shade. 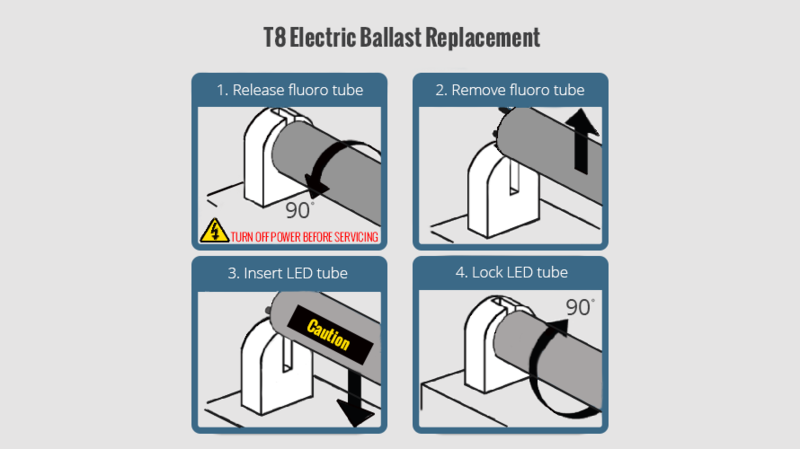 It uses standard mains input voltage though please be aware that T8 tubes won’t work with your existing ballasts and may require some additional wiring for installation. 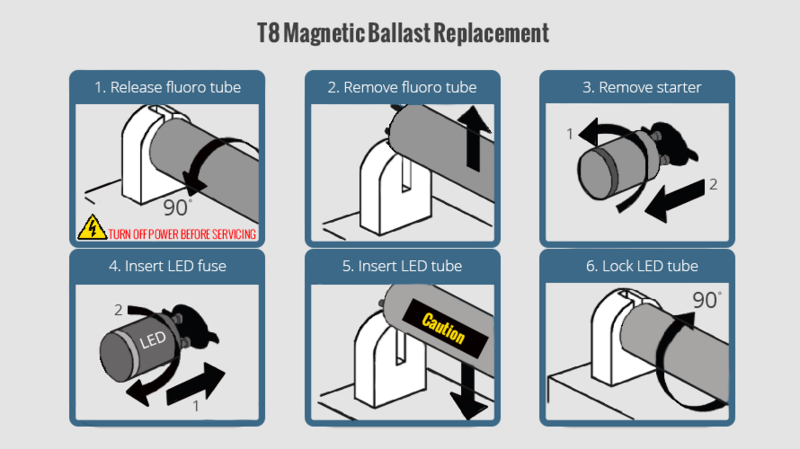 If you’re not sure about the differences between electronic and magnetic ballasts, then we do advise consulting a qualified electrician. Depending on how large the area is that you’re planning on using this tube light, 1500 lumens might be too much light, and might be overpowering. You may be better off going for our 2ft T8 LED Tube Light. It consumes less power at 10W but still shines with a very respectable 800 lumens. The shorter length also makes it better for smaller areas too, and could even be used in the garage at home. Please feel free to have a browse of our wider range of T8 tube lights, and see what other lengths and brightness’s we stock. With such a huge push to start using green technologies, you might be wondering how LEDs fit into all this. It starts with their energy efficiency. Let’s compare LEDs to conventional incandescents. Incandescent bulbs lose up to 80% of their energy to heat wastage alone, leaving just 20% to actually provide light. LEDs on the other hand only lose about 10% to heat. This is a tenfold difference in efficiency, and means that LED lights use considerably less energy, and thus less fossil fuels are burned as a result. LEDs also cause less harm to the environment as they are much easier to recycle compared to fluorescent lights. Fluorescents have Mercury vapour in them. This is dangerous enough to you if it leaks, but is worse for wider natural ecosystems, as most people’s exposure to mercury comes as a result of coming into contact with contaminated fish. LEDs don’t suffer from these problems, making them a lot safer to use too. Offers That Let You Save Money! When you buy 5 or more of our featured 4 feet T8 tube light, you’ll get a special volume discount price which is handy if you’re looking to use it for more commercial applications. You could save up to a further 20% off selected items, with our T8 tube light included in this, by using our LED discount codes. We update these deals all the time so check back regularly! If you need to return your tube light for any reason, you can make use of our 28 day refunds and exchanges policy. We just need the item back in re-sellable condition with all original contents and packaging. Mirrorstone also provide a 2 year warranty with this item, giving you further assurances further down the line. You can speak to a member of our friendly customer services team on 0116 321 4120, or send us an email at cs@wled.co.uk if you have any further questions about this 4 ft 18W tube light, installations, wholesale enquiries or anything else. I got this to replace a flickering 36 watt fluorescent tube. I bypassed the ballast myself, a very easy job. I am very impressed by the light output and instant output. We love the light this gives out is was our first time using Wholesale led lights and we are both more than happy with the end result. Would strongly recommend both product and supplier. very easy to fit, instructions helped. change starter and put in new light. looks very good in our new garage, thanks to thom for help.